It was a bit of a coin toss which game would get Best Online Multiplayer between Mario Kart 8 and Super Smash Bros. for Wii U, as both have taken countless hours of my free time. In the end it boiled down to smoothness. Smash Bros., while mostly a solid online experience, can get really laggy when it wants to. So while they may be equals in terms of their addictive nature, I have never encountered a slow race in Mario Kart 8, so it gets the edge. But why not one of the more hyped FPSs of 2014? Simple, because Mario Kart 8 represents Mario Kart at its very best, and its online functionality is at the height of the series. There’s no game-breaking mechanics like Mario Kart DS, the items feel less chaotic than Mario Kart Wii, and it allows more players (and better level design) than Mario Kart 7. In a nutshell, it’s the very best Mario Kart has to offer, for up to twelve players in matches that are as smooth as silk. You can even record your races and upload them directly to YouTube, a feature I hope Nintendo revisits down the road. 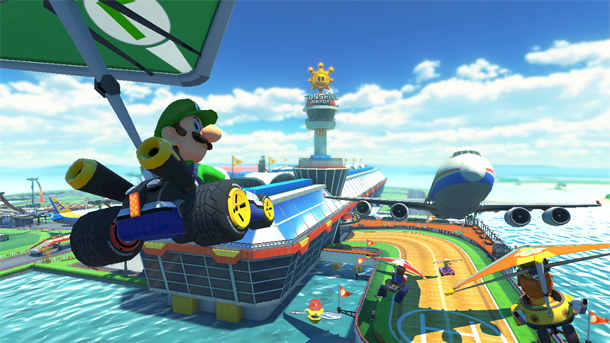 The items will fly, the racers will drift, and Luigi will death stare. Be weary though, a ‘few quick rounds might just turn into hours of cursing at your television screen as you get knocked off course repeatedly and lose first place. Mario Kart can be played with a moderate connection, the dynamic of fighting an opponent really makes Smash a lag-or-gtfo sort of situation, clear winner really. The majority of matches I’ve played in Smash Bros. have worked, but when it doesn’t it’s an absolute disaster. You either get delayed actions or (even worse) ten minutes of freeze frames. But when it does work it’s an absolute blast. At its best its amazing, however when you wanna judge something you gotta look at the middle line quite a lot, the middle line of smash being a jittery or slightly slowed down match that bores everyone. I agree on giving the award to Mario Kart 8 on the basis of Smash Bros being laggy, or at least being a kind of game that is very affected by any kind of minor lag. Something about Mario Kart 8 that you forgot to mention when comparing it to previous online titles of the franchise is that it is also way more balanced than Mario Kart Wii. As a kart-only user I suffered quite a bit to keep up with the bikes on that game, which were by far the superior vehicle. I am still proud (in a silly kind of way) that I was able to constantly rank high with my Koopa Troopa, standard kart, and Wii Wheel setup! Smash Bros. usually works fine, but the lag, even at its less offensive times, can be crippling. I’ve accidentally fallen of stage way too many times through no fault of my own, but because the game couldn’t register my button press through the lag. Still, the fact that I’ve put so many hours into the online modes is telling how worth it it is when it does work. I guess I should have brought up the greater balance in vehicles, however, I will say I did kind of bring up the game’s overall better balance over its predecessors (I acknowledged ‘snaking’ from DS and the overabundance of items in Wii). That’s true! Snaking ruined Mario Kart DS’ online. It was a shame, because I was awfully excited to play Mario Kart against players around the globe. I played Mario Kart DS like crazy at first. But once snaking became a thing and you simply couldn’t win unless you exploited it, all the fun was sapped away. I know most people still rave about Mario Kart DS, but I’d actually put it near the bottom of the Mario Kart ladder just because of snaking. I do prefer Smash Bros. Wii U to Mario Kart 8 overall, but Smash Bros’ online matches can suffer from serious lag at times. Whereas I’ve had no lag problems with Mario Kart. Hence, I gave Mario Kart the edge here.